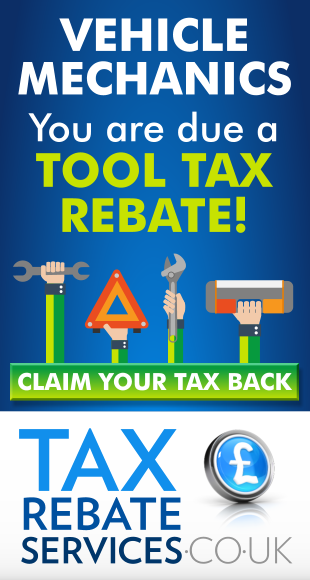 If you are a Mechanic or Vehicle Technician you can usually claim a mechanics tax rebate by claiming tax relief for the cost of tools or other equipment that you use during your work, if you have paid for these yourself. This also applies to specialist clothing required for you to complete your job. You can only claim for tools, equipment or clothing that have been purchased specially to use in your work, and you cannot claim if your employer has reimbursed you for the costs in full. Tool Tax Relief – what are flat rate expenses? Tool Tax Relief – what are capital allowances? What about tax relief for specialist clothing? If you are eligible for tax relief for tools and specialist equipment or clothing, you can usually make a mechanics tax rebate claim for a flat rate deduction. In most circumstances you do not need to provide receipts. You may be able to backdate your claim for up to four years. The flat rate expenses are included in your tax code, so that you will need to pay less tax in future years. The amount of flat rate expenses that can be claimed is determined by HMRC. If your spending on tools and equipment exceeds £120 annually, you may be better off making a mechanics tax rebate claim by claiming tax back on tools through a capital allowances claim instead. Tool Tax Relief– what are capital allowances? You may be able to claim a tool tax rebate for tools and specialist equipment through a capital allowances claim. In this case, full receipts or proof of purchase will be required. You may be able to claim for purchases made at any time in the past, if receipts or proof of purchase are available. A mechanics tax rebate capital allowances claim can only be made for tools and equipment purchased solely for your work. You can only make a capital allowances claim for certain items, according to HMRC regulations, and items must pass testing requirements where necessary. Depending on your job, you may also be able to claim tax relief for the replacement, repair and cleaning of specialist clothing such PPE – Personal Protective Equipment. This only applies if you have paid for the original item, and have not been reimbursed by your employer. Can I Claim Tax Relief for Professional Fees? Can I Claim Tax Relief for the Cost of Shoes and Tights? What about Tax Relief for Laundry Costs? Can I claim Tax Relief for Business Mileage? Can I claim Tax Relief for Specialist Equipment? Teacher Tax Relief for professional fees – NUT tax relief, NASUWT tax relief. Am I Eligible for Uniform Tax Relief for Washing Uniform? What am I actually claiming back? How much will I get from a Uniform Tax Relief claim? Can I claim for any other Tax Relief? Can I Claim Tax Relief for other using Public Transport? What about Accommodation and Subsistence? Tool Tax Refund – What are Capital Allowances? Can I Claim Tax Relief for Specialist Clothing? If I am a student can I claim a Student Tax Refund? What About if I work during the Summer? What counts as a Temporary Workplace? What are the Business Mileage Rate Allowances? Travel Expenses – Can I claim any further Tax Relief? When can I claim tax relief (business mileage) for travel to a temporary workplace? When can I claim tax relief (business mileage) for travelling to work in different locations? If I use public transport can I claim tax relief for a travel card? When can I claim tax relief for Subsistence and accommodation? Do I need to use the cheapest transport or accommodation to claim tax relief? Travel Expenses – How much can I claim? My Employer Reimburses Me Can I Still Claim? Tools Tax – When am I Eligible for Tax Relief on Tools, Equipment and Specialist Clothing? Tools Tax – What are Flat Rate Expenses? Tax relief for tools – What are Capital Allowances? How do I know if my tax code is wrong? How do I reclaim a Tax Code Tax Refund? When am I entitled to leaving the UK tax back? How much UK tax back can I receive? Do I need to complete Tax Claim Forms when leaving the UK? What sort of UK Income is eligible for tax relief? How do I apply for UK Non-Resident Tax Relief? Do I need to Complete a Self Assessment Form? What is the UK Non Resident Landlord Scheme? What if the property is administered by Letting Agents? Can I claim Tax Relief for Property Expenses? How does the Non Resident Landlord Scheme affect my Tax payments? How does other income affect my tax allowance? What is Seafarers’ Earnings Deduction? What is a CIS Tax Refund? How do I get a CIS Tax Refund? What is the average CIS Tax Refund? Should I fill in my Tax Return myself or use an Accountant? Can I get a refund on my Car Tax/Vehicle Tax? Can I claim a Council Tax rebate? What kind of Donations Apply to Gift Aid? Gift Aid Claim Tax Refund! How Do I make a Gift Aid Claim?